A 3-in-1 fan edit of the Star Wars prequels. This is a fan production and is not for profit or commercial use. This production is protected under fair use. Star Wars: 2017 © & ™ Lucasfilm Ltd. All rights reserved. All trademarked and copyrighted licenses are property of their respective owners. All three prequels have been condensed into one 2 hour and 20 minute movie. The last 20 minutes of The Phantom Menace makes up the first 10 minutes. Attack of the Clones and Revenge of the Sith are pretty much equally split for the rest of the movie. Lots of little minor cuts to make things less tone deaf, sometimes just single words or a few frames. If i felt embarrassed to be watching it, I’d cut it and that worked out pretty well I think. Anakin is the clear protagonist of the movie. He is more confident and less whiney and generally seems more justified in disliking the Jedi, who are sort of dicks to him all the time. 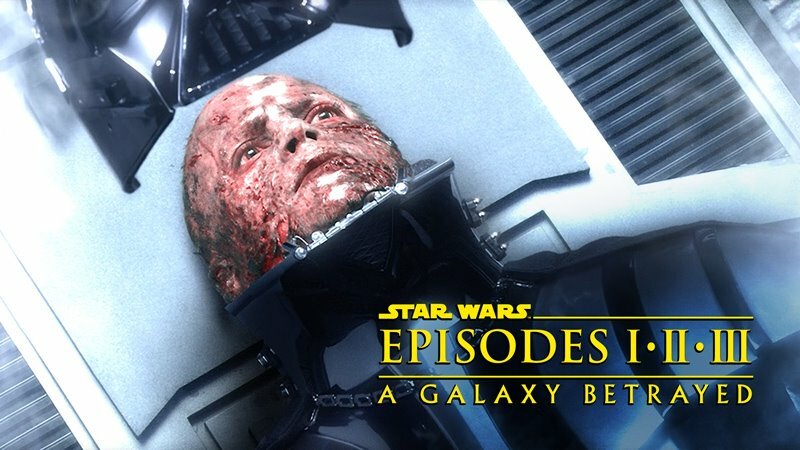 The opening scenes of Episode III have been drastically reorganized to maximize the build of tension on him to help better motivate his fall to the Dark Side. Anakin is crushing on Padme hard but isn’t a creep and doesn’t make his feelings known. Padme is flirtatious with Anakin and doesn’t give him the cold shoulder. She makes the first move. They have some fun together, but things get complicated in the third act. Faster/more intense actions sequences with more believable physicality. I’ve tried to make the action more visceral by removing anything that looks too video-gamey or like it would kill a normal person. This edit tries to be Clone agnostic. I don’t love the idea that the entire Army of the Republic is a copy of an evil bounty hunter in league with the big bad guy of Episode II and nobody seems to care. I do like the Clone Wars cartoons and the stories they tell though. So they aren’t ever stated to be clones in this edit but you can still see that they are if you pay attention to the background. Obi-Wan never goes to Kamino or meets Jango, so you could fill in the blanks with your own head canon if you’re into that. R2-D2 and C-3PO are much less prominent. 3PO isn’t ever named as such and doesn’t speak until the after-credits sequence. Chaos is engulfing the galaxy. • No Jar-Jar dialogue. He is now a non-speaking background alien. • No C-3PO dialogue. He is now a non-speaking background droid. • No mention of Midichlorians. • No Anakin is the chosen one prophecy subplot. • No young Anakin flying a starfighter. • No reaction shots of every lost lightsaber, blaster, or hand. • No gratuitous shots of spaceships landing. • No named Darths except Darth Plagueis and Darth Vader. Sidious is just Sidious. • No poison slug assassination plot, Zam’s drone has a blaster now. • No Kamino or Clone storyline. • No mention of Jango Fett’s name. • No young Boba Fett. • No Jango vs. Windu fight. • No Yoda commanding armies. • No Dooku vs. Anakin & Obi-Wan fight on Geonossis. • No action frog Yoda lightsaber fights. • No slapstick Palpatine in the elevator shaft. • No crash landing on a mile long runway on Couruscant. • No Chewbacca (except one long shot of him in the background). • No Obi-Wan vs. Grievous pinwheel lightsaber fight. • No duck face grimaces during the Palpatine/Windu fight. • No Yoda/Palpatine lightsaber fight. • No mention of Padme’s losing the will to live. • No surprise last minute Force Ghost plot hole glue.